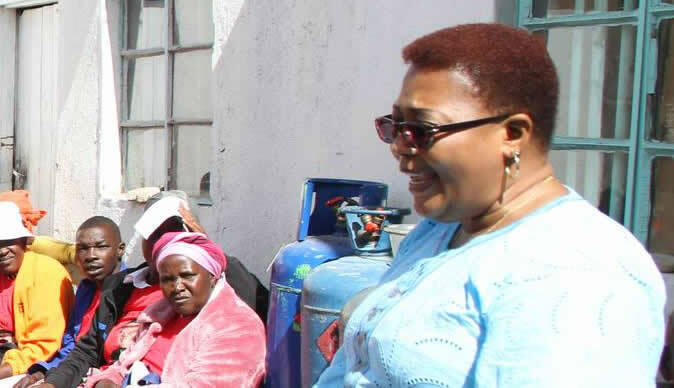 MDC-T Deputy President Thokozani Khupe on Wednesday went on a door-to-door Get Out The Vote Campaign (GOTV) in Ward 10 of Sunningdale Constituency in Harare where over 400 prospective voters had their proof of residence affidavits certified in order for them to register to viote. Over 400 affidavits were signed for potential voters who were flushed out of their houses between 10:30am and 12:30pm. Khupe was accompanied by MDC-T Deputy Secretary General, Honourable Paurina Mpariwa, Deputy National Chairperson of the MDC-T Assembly of Women Honourable Dorothy Molly "Gonyethi" Ndlovu, Member of Parliament for Sunnigdale Honourable Margaret Matienga, Bulawayo Provincial Secretary Honourable Nomvula Mguni, Matabeleland North Provincial Chairperson of the Assembly of Women Honourable Lwazi Sibanda, Pastor Muroyiwa from the AFM Church, Harare Provincial Secretary of the Assembly of Women Lindani Moyo, and Ward 10 Councilor Hami Madzingira among others.